President Kagame has vowed to exterminate whoever dares speak his mind. What he hates the most is when he is reminded that one time he will face trial over his war crimes. Rwanda and South Africa are still on speaking terms, but only barely – and if Dirco gets its way even this tenuous relationship will be terminated in the next few days. South Africa, finally, has had enough of Rwanda doing its dirty business on South African soil and has expelled three diplomats, with the ambassador to follow shortly. It’s a bold move, but have we thought it through? By SIMON ALLISON. Relations between South Africa and Rwanda are at an all-time low after South Africa expelled three Rwandan diplomats on Thursday. And relations are about to get even worse. South Africa, understandably, has had enough of Rwanda doing its dirty business on South African soil. First there was the assassination attempt on the life of Faustin Kayumba Nyamwasa, the former Rwandan general turned vocal critic of President Paul Kagame’s regime, in 2010. Then, earlier this year, there was the murder in a Sandton hotel room of Patrick Karegeya, the one-time head of Rwandan intelligence, who had fled his country looking for political asylum in South Africa. It wasn’t. The final straw came last week, when armed men broke in Nyamwasa’s Johannesburg home in another apparent assassination attempt (Nyamwasa was not home). This time was different, however. Previously, South Africa has not been able to link definitively the Rwandan government to the incidents, which means no public action could be taken against Rwanda – innocent until proven guilty, and all that. But last week someone must have messed up. According to diplomatic sources, South Africa’s security forces were able to tie the break-in to three Rwandan diplomats working from their embassy in Pretoria (one Burundian diplomat was also involved, apparently). The department of international relations (Dirco) wasted no time in taking action, revoking the dodgy diplomats’ credentials and sending them packing. Given their diplomatic immunity, this was the most serious punishment available to Dirco. Given that there were only four diplomats in the Rwandan embassy to start with, Ambassador Victor Karega must be feeling a little lonely. Rwanda was just as quick to respond, with interest. “We have expelled six South African diplomats in reciprocity and concern at South Africa’s harbouring of dissidents responsible for terrorist attacks in Rwanda,” said Rwandan Foreign Minister Louise Mushikiwabo, parroting Rwanda’s official line that South Africa, with its ultra-progressive approach to refugees, provides a safe haven to Rwandan terrorists and genocidaires. Mushikiwabo may have a point (although not one that justifies extrajudicial, extraterritorial assassination): Neither Nyamwasa or Karega are angels, and are both themselves implicated in the abuses of Kagame’s regime; while there has long been concern that perpetrators of the 1994 Rwandan genocide are hiding out among the Rwandan exile community in Johannesburg. The row will escalate even further. Speaking anonymously, a senior Dirco official told the Daily Maverick that South Africa was planning to sever all diplomatic ties with Rwanda within 72 hours. 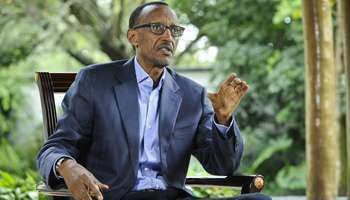 “SA will not stand by and watch people be killed on our soil by another government, just because we happen to be opposed to a sitting regime,” the official said, adding that the freeze in relations is likely to continue for as long as the “cowboy” Kagame remains in office. That could be for quite some time. Kagame’s term expires in 2017, and he’s not constitutionally permitted to run again. However, constitutions can be amended, and Kagame has previously floated the idea of a third term. Of more immediate concern is the Democratic Republic of Congo, where South African troops are part of a United Nations force fighting rebels in the eastern provinces on the border with Rwanda. Those rebels are generally assumed to be supported by Rwanda, making the conflict something of a proxy war. At the moment, the rebels are very much on the back foot, having been overwhelmed by the UN force’s superior military power. The next step is to create some kind of lasting peace, addressing the issues which lie at the root of the conflict – an already difficult task, made exponentially more so if two of the protagonists in the conflict are no longer on speaking terms. Previous South Africa: Rwandan Politician’s home attacked by gunmen. Next Ingabire Victoire, Faustin Twagiramungu and Fr. Thomas Nahimana, the most popular politicians of Rwanda.